The international Monument for the Unknown Child in progress is a unique global place that refers to the suffering and injustice of children worldwide. 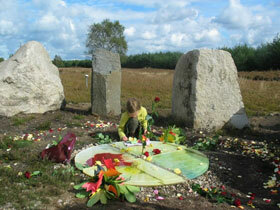 At the National Ash-scattering field Delhuyzen near Arnhem, the International Monument for the Unknown Child arises. This beautiful spot – amidst the natural beauty of National Park de Hoge Veluwe in the Netherlands - was put at our disposal by funeral insurance and funerary service company Yarden. This world monument creates a bond between the children of the world and expresses suffering and dying as well as mourning and comfort following a loss. It draws our attention towards the exceptionally difficult circumstances that children sometimes live in: children who live on the dark side of life. It is a monument of hope and trust. With this monument we whish to remember children who are no longer with us and pause for a moment with the children of now, and with the future of all children. This monument-in-progress is made up of 35 stones. 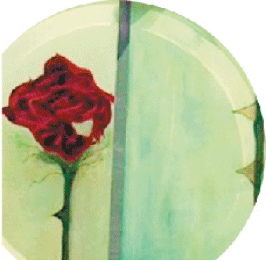 The 35 participating countries will in turn receive the work of art ‘Rose’. This rose is the starting point for a Monument for the Unknown Child in these countries. The International Monument for the Unknown Child is a world-wide monument, that sends out a message aimed at everyone. It demands attention for the situation of all children in the world. In this way it creates attention for the Unknown Child all over the world.